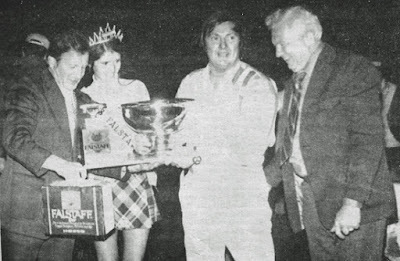 Butch Hartman accepts his trophy from Falstaff representatives after winning the inaugural Falstaff 100 at Hawkeye Downs Speedway. 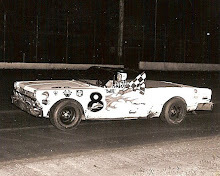 Cedar Rapids, Iowa (September 29, 1973) – Butch Hartman, the pride of South Zanesville, Ohio, improved his claim to a third national championship by claiming the Falstaff 100 for United States Auto Club stock cars on Saturday night at Hawkeye Downs Speedway. 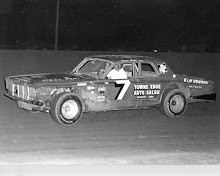 Hartman put his 1973 Dodge into the lead spot on the opening lap and was never headed, although he had all he could do to hold off the efforts of Ernie Derr of Keokuk, Iowa, for the final five tours of the half-mile dirt oval. 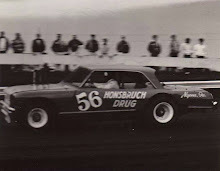 Derr’s 1972 Dodge was right on Hartman’s rear bumper when the checkered flag was thrown. 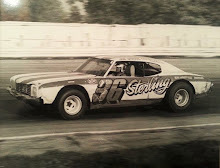 Less than a second behind Derr was Ramo Stott, also from Keokuk, Iowa, driving a 1973 Plymouth. The victory was the eighth of the season for Hartman, who already wrapped up his third straight driving championship, a feat never before accomplished in USAC stock car history. “One more win will help us tie the record and that’s what we’re going after next week,” Hartman said moments after climbing from his car. The record of nine wins in a season, was set by Don White of Keokuk, Iowa, in 1967. Hartman will get his chance next Saturday at Texas World Speedway. White, who owns the most career wins in USAC history (49), was on hand last night, but he smoked an engine during hot laps and wasn’t able to compete. An estimated 3,000 braved the chilly weather and the threat of rain, which had drenched the track several days prior to the event. The battle between Hartman and Derr gave them plenty to remember. They were on their feet when Derr made a move to the outside coming out of turn two on the white flag lap. Derr and Hartman would tangle a little heading down the backstretch but both drivers would manage to keep their machines under control and resume their bumper-to-bumper duel to the finish line. Hartman started the feature on the outside of the front row alongside Ramo Stott. Ramo earned the pole position with the top qualifying time of 26.43 seconds. That bested Hartman by a hundredth of a second. Stott also took the four-lap trophy dash, flashing past Derr on the last lap. 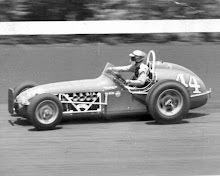 Irv Janey of Cedar Rapids, experienced engine problems and completed only 30 laps in the feature, finishing tenth. 11. A.J. Moldenhauer, Madison, Wis.
13. Jerry Wolland, Peoria, Ill.